Freedom of Speech was the first in a series of four paintings which depict examples of the four basic freedoms of Americans. 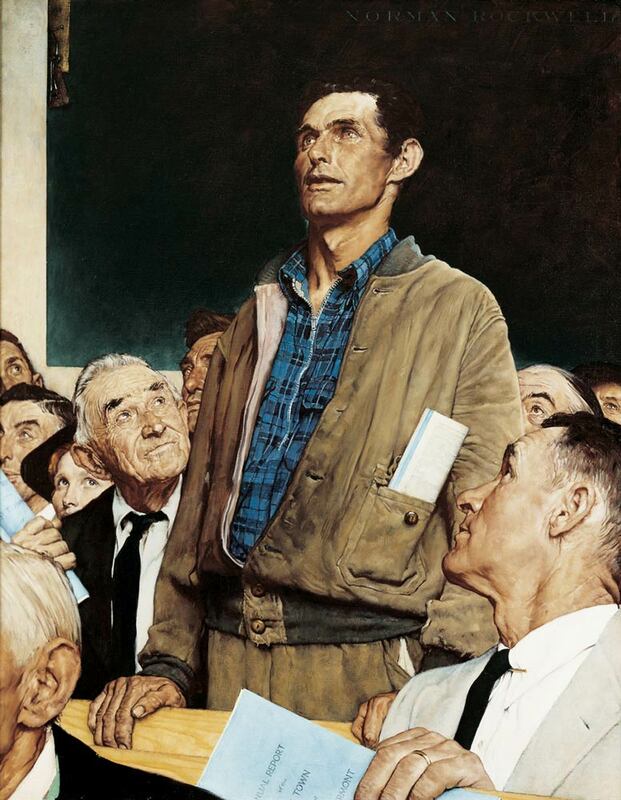 Freedom of Speech depicts a young man who appears to be of the American working class, given his plain clothing over which he wears a plain, brown jacket. Protruding from a front pocket of the jacket is a folded document that appears to bear importance in the matter at hand. This main character of the painting is standing in the midst of a meeting of importance to the locality in which he lives and/or works. He is surrounded by older gentlemen, wearing traditional suits and ties, but who are looking at him with a degree of curiosity mixed with consideration for the young man’s oratory. The young man appears to be unfazed by his modest attire in the midst of formality, focusing instead on the subject matter that concerned him to the extent that he felt it necessary to attend this meeting and speak his mind. Freedom of Speech was painted by renowned American artist, humorist, and painter, Norman Rockwell. The inspiration for the painting came from the State of the Union address, delivered in January of 1941 by President Franklin D. Roosevelt, in which he set forth the four basic freedoms that Americans have the right to enjoy. This painting was the first of the series and appeared on the cover of The Saturday Evening Post‘s February 20th issue. Mr. Rockwell, in his usual style, includes discreet inferences in this painting which may not be immediately obvious upon initial viewing. For instance, the bench immediately in front of the young man is conspicuously empty. This has been viewed by some as an invitation to the viewer to attend the meeting as well. Others see the empty bench as a portrayal of the fact that someone did not feel compelled to attend the meeting. Another interesting fact behind this painting is Mr. Rockwell’s inclusion of the faces of people he knows in his work. And, finally, the manner in which he pointedly signs his own name in the dark background of the painting depicts his own humility in the face of such a powerful message.